Fran Wilde is an author and technology consultant. Her first novel, UPDRAFT, debuts from Tor on September 1, 2015. Her short stories appear in Asimov’s, Beneath Ceaseless Skies, Nature, and Tor.com, while her nonfiction interviews with writers appear under the banner “Cooking the Books” at Tor.com, Strange Horizons, the SFWA blog, and at franwilde.wordpress.com. You can also find her on Twitter and Facebook. ACW: Welcome, Fran! First off, congratulations on the publication of Updraft! I feel incredibly lucky to have read an early copy of this novel. It’s been tough waiting for the book to be out in so I could squee about it without spoiling it for anyone, so I can only imagine how you’ve felt! To start things off, care to give us a taste of what Updraft is about? FW: I feel incredibly lucky to have you as a beta reader. Updraft is about a city built on towers of living bone; it’s about secrets and laws, monsters, songs, wind and silence. It’s the story of Kirit and her friend Nat, and how breaking a law leads to consequences unimaginable and deadly. ACW: I love everything about the world you’ve built for this book, and the characters are amazing. You’re currently working on the third book in the series. Were there any challenges you faced writing the second and third books as opposed to the first? Was it easy to slip back into the characters’ voices, or did you have reintroduce yourself to everyone before they would start telling you their stories again? If you can say without giving too much away… Did anything about the characters or the direction the story took surprise you while writing the second or third book, or did you have everything more or less mapped out in your head from the beginning? Updraft was written, initially, in six weeks. Then I revised the second two thirds completely, over another few months. At times, it felt like the story was spilling out of me. Cloudbound is similar in some ways, but there were new directions I wanted to go, and new themes I wanted to explore (and upend). The hardest part is getting all the details right – the tower names, secondary characters’ eye color. Thank goodness for notes, and copy editors. And yes! A lot surprised me about the second book! I didn’t want to write in the comfort zone of the first book, so I’m glad for that. I loved writing it for that reason. 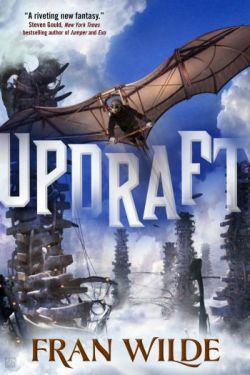 ACW: Because I’m a bit of a process nerd, I’d like to talk a bit about Updraft’s origin story. The first novel started life as a short story, correct? When did you realize it was actually a novel, and how did you go about expanding it? Are there bits of the story that remain intact more or less the way you originally wrote them, or did everything change as the world expanded? Correct. The first book began as a short story – the second short story I’d written in this world. The first short story is actually part of the second book (take that, process). I realized with the help of beta readers that there was much more to it. Lots of things changed. The singing and wind, the wings and the towers? Those stayed the same. So did the characters in the stories. ACW: On another process-related note, you did some rather unique research while writing the first book – indoor skydiving in a wind tunnel. Could you tell us a bit about that and how it impacted the flying scenes in your books? What other types of research have you done for the series, and what’s your favorite bit of odd, or new knowledge you gained? I wrote a whole post about the wind tunnel for iO9! It was a great thing to do – I learned so much about how a body moves in that space, and how small changes impact things like roll and lift. As far as other research, I did a lot of background reading on monsters. I grilled my resident scientist for details about chemistry. I looked at a lot of high-altitude foods. And sinew – how it was used for sewing and light construction. And cephalopods. Lots of research about them. ACW: Let’s talk about Cooking the Books for a moment. You started the series in 2011, and you have interviewed some amazing authors about the intersection between food and fiction. The series has since morphed into a podcast, and gained a sibling series, Book Bites. Do you have a favorite recipe from the series? What’s your personal go-to comfort food when you’re writing? Does cooking help you work out plot problems, or are there other things you turn to when you need to distract your brain so it can do its work? When I’m writing, anything crunchy is my go-to. That’s dangerous because potato chips are crunchy, and so is popcorn. But snow peas and carrots are where I’m at these days. Sigh: less fun, but better for me. Cooking is hard for me when I’m on a deadline. I get very distracted. And I’m a *terrible* baker except for cookies. Too much measuring. I like to see what I have in the fridge and improvise. But when I have time, cooking with family and friends is one of my favorite things to do. Favorite recipes from the blog? There are too many. I’d rather hear what other folks’ favorite recipes are from the blog. What are yours? ACW: One of my personal favorites is blowtorch-cooked marmot, courtesy of Elizabeth Bear. It’s not something I would cook personally, but it’s…certainly memorable as far as recipes go. But back to fiction writing – how different is your writing process for your short fiction and poetry versus your novel process? Are you able to work on short fiction while you’re deep in a novel, or do you have to completely separate the two? Songs play a key role in Updraft, so I also want to ask – what is your songwriting process like? What made you want to include actual lyrics, versus simply alluding to the fact that characters are singing? ACW: Other than the third novel, what else are you working on currently, or do you have coming up that you want people to know about? I’ve got a couple more novels in the works – one is in editing, several are nascent. There’s a gem universe novella coming from Tor.com next spring — “The Jewel and Her Lapidary,” as well as more gem universe stories, and several bone universe stories. And I have a project I can’t talk about yet, but I should be able to do so soon. ACW: Ooh! I can’t wait to hear more… Thanks for stopping by! thank you for having me, A.C.!